In an age when film studios are leaving no stone unturned in their quest for inspiration, turning to blogs, theme park rides and songs in search of subject matter, it was only a matter of time before the venerable G.I. Joe got his own live-action blockbuster. Rather than a single clean-cut soldier a la the toys which bear his name, G.I. Joe is here the name of an elite strike force of the not-too-distant future, a crew which features some of the world’s best undercover operatives fighting on the side of right. When Duke (Channing Tatum) and his buddy Ripcord (Marlon Wayans) stumble across the Joes, they decide they want in. The pair have been entrusted with delivering a top secret weapon to NATO forces. 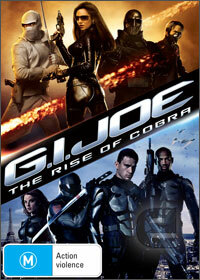 Along the way they are accosted by naughty vixen The Baroness (Sienna Miller) and her team of Cobra mercenaries, who are desperate to acquire the weapon at all costs. As it has the power to destroy entire cities, the G.I. Joe squad are understandably reluctant to let this happen, and five minutes into the action the viewer knows this is one struggle that’s going to involve a heck of a lot of gunfire, martial arts and explosions. It may not win any awards for originality, but this is big, bombastic entertainment at its finest. Tatum pulls off the square-jawed, wholesome All-American bit with aplomb, and Sienna Miller is excellent as the vampish Baroness. No expense has been spared on the special effects, and while aspects of the feature certainly aren’t without their faults, director Stephen Sommers (The Mummy, Van Helsing) certainly gives it his all on this fun, high-octane adventure. There are enough plot convolutions to keep you interested, and numerous critics such as Roger Ebert confessed they found the film more entertaining than the recent Transformers sequel. Though it received far from unanimous praise the film was nonetheless a financial success, taking in over $300 million at the worldwide box office and selling millions of copies in its week of DVD release alone. A sequel is also in the pipeline, and will see all the principle cast members reprising their roles. It seems this is yet another children’s toy that, having been brought to life on the big screen, intends on sticking around for a while.